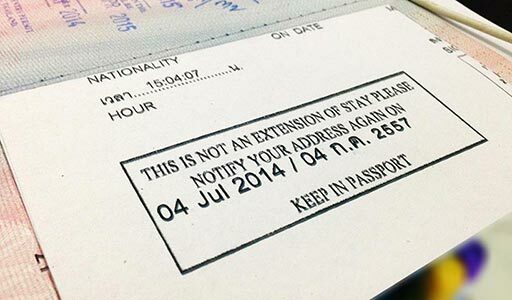 If you are a foreigner staying in Thailand for a period longer than 90 consecutive days holding a Non-Immigrant Visa or Extension of Stay, you are required by Thai Immigration to report your current address every 90 days. You must file this report within 15 days before, or 7 days after, your 90-day period expires. However, if you leave Thailand anytime during the 90-day period, then the day count will restart from 1 upon your re-entry into Thailand. Filing the 90-day report is fairly easy. You can report to Thai Immigration either in person, or you can authorize someone to report for you. You can even send the notification via registered mail or through the online notification. Envelope with 5 Baht stamp affixed and return address of foreigner for the officer in charge to send back the lower part of form TM. 47 after having received the notification. This part must be kept for reference and for future notifications of staying over 90 days. Please note that you have to keep the receipt of the registration for verification purposes when sending registered mail. It is better to keep track of the rules of Thai Immigration at all times during your stay in the country, as failure to file your 90-day report can result in a fine of 2,000 THB, and can increase to up to 5,000 THB once you get arrested.